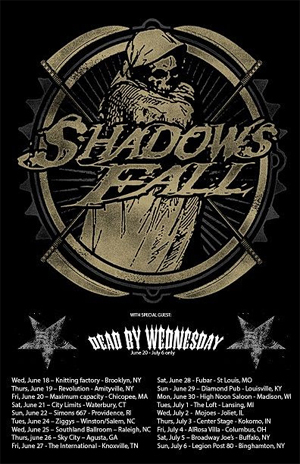 "SHADOWS FALL is excited to announce that we will be hitting the road this June and July for a short run of headlining shows across the East Coast and Midwest! We will be joined by our friends in DEAD BY WEDNESDAY along with local bands from each city as support. This is a chance for us to check out the local music scene in each city and play some small club shows where we can jam out an extended set filled with songs we rarely play or have never played live. These will be our only US shows of the summer so make sure to come down and party with SHADOWS FALL when we roll through."